Sometimes a project is spurred on by necessity. I've had a pillow form sitting on our entry way bench, stark nekked, for over a year. I even had a photo of it in our house tour, which is even more sad. I didn't want to waste time or money on a so-so cover, which is why the poor thing was nekked for so long. I finally figured out what would work here! It's no secret that I'm an Anglophile. I think it all started in the 80's for me. I was bit hard by the New Wave bug, and all things English appealed to me from then on. It runs in my blood too- both my great grandparents were from the U.K. Anyway, I decided to make a fabric strip Union Jack, and show you how to sew a simple envelope enclosure pillow! Don't be intimidated- it's really easy. 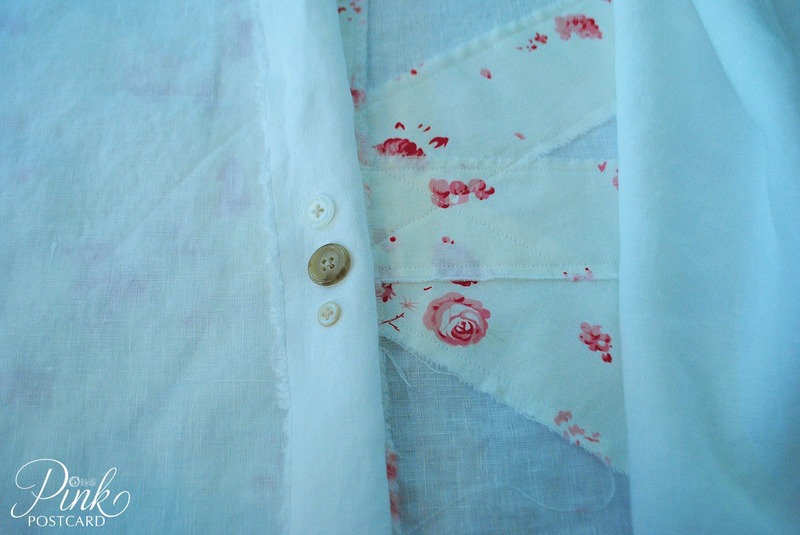 I used white linen as my base fabric. While linen is very beautiful and timeless, but it tends to be a bit shifty when cutting and sewing, so if you're a novice, you might want to try something like cotton or upholstery weight cotton for a first go. My pillow was a 24" x 16". Using a disappearing ink pen (found at any fabric store), and a tape measure, I marked out my pillow top to the exact 24" x 16". I do all my pillows this way. You may be wondering about seam allowance, but trust me- it will fit snug with out any loose, excess fabric, and be A- OK in the end. 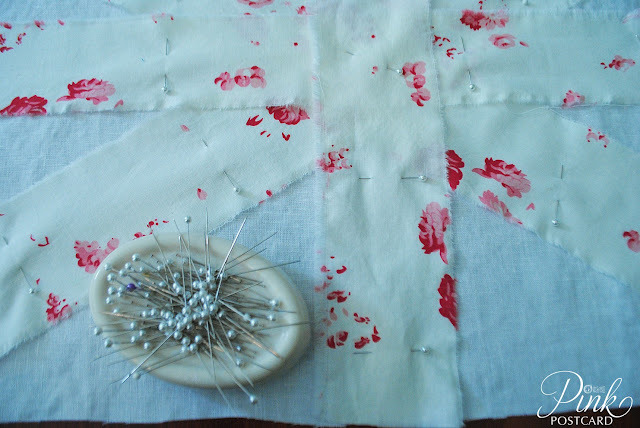 Cut the fabric on your marked lines, and set aside. What's a disappearing ink pen? 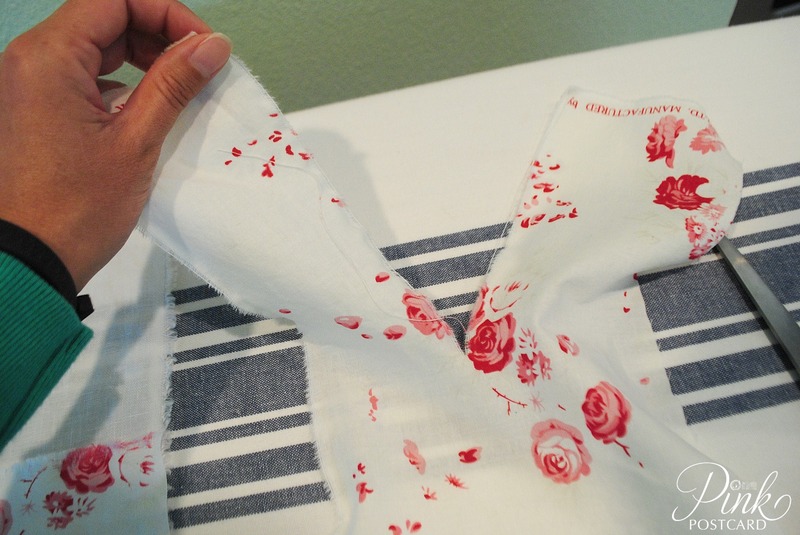 It marks fabric clearly and eventually fades and /or washes out. 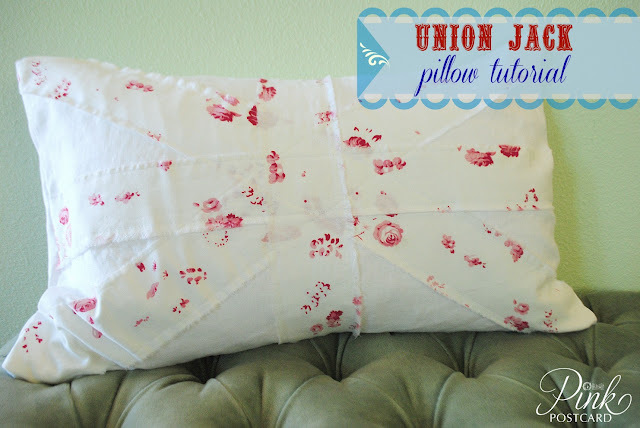 If you are doing a Union Jack pillow like this one, read on! 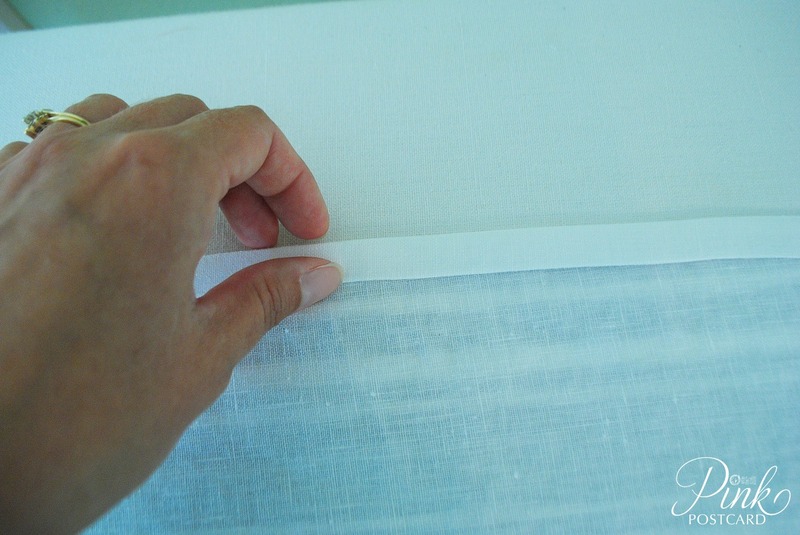 If you're doing a basic envelope enclosure pillow, skip to #5. I measured out 3" on my fabric, and snipped it to get the tear started. Why tear? Because I wanted frayed edges for fun. You may have an uneven tear on your first try. This is because tearing fabric runs along a thread, vs. cutting which may cut across threads. If you need a second strip that isn't pointy like a V at the bottom, snip again on your selvage edge (the clean line at the edge of the fabric- usually where the manufacturer's info is- as seen in photo above) , and tear again next to the same spot on the fabric, and you'll get a 3" strip, top to bottom. You will need 4 strips- 2 long ones to go across your pillow in an X, and one vertical and one horizontal. Got em? ok, let's move on. I ironed all of my fabric at this point. The torn edges curled a bit, so this helps to have them lay flat when you go to sew it to the top. Lay your strips of fabric on your pillow top, starting with the X, then the horizontal, then the vertical. Pin all of the strips in place so they won't shift while sewing. Make sure your frayed edges lay flat on the fabric before sewing over them- you don't want them bent wonky when you sew over them. It leaves a nice frayed edge, but keeps all the strips in place. Just pick a strip to start with, and sew down both edges, until you've done all 4. Here's where you need to pay attention. We're making the envelope enclosure part, so you will need a little extra on the length, to make sure there are no gaps. 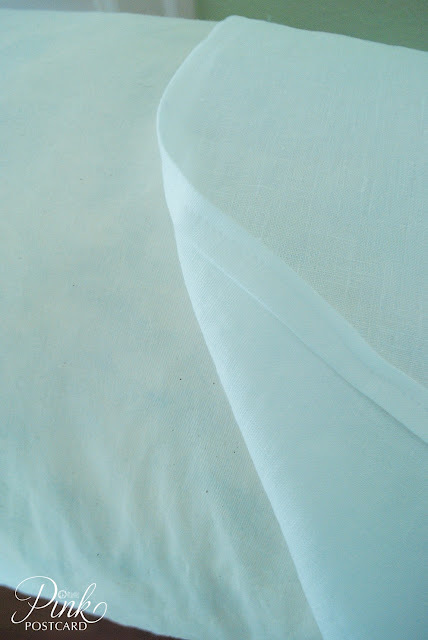 For this pillow I cut a piece of the linen 16" wide, and then 30" long. This is an extra 6" on the length. Six inches always seems to come out right for the envelope enclosure, regardless of what size pillow I am doing. 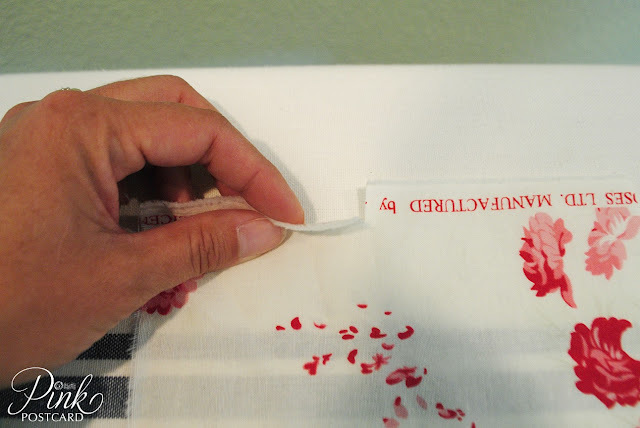 It allows enough for you to fold your seams over, and keep the ends together without a gap. The envelope enclosure will overlap nicely with the 6" extra. 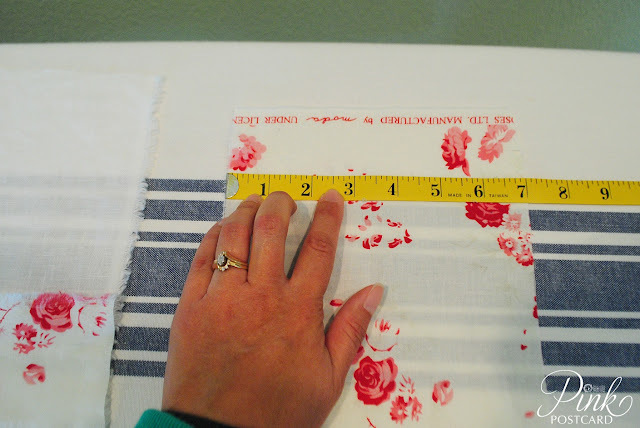 Mark your fabric with the disappearing ink pen and tape measure, and cut it out. You can then cut right down the middle (be exact). Now you have 2 pieces for your envelope enclosure! Using a hot iron, make a 1/4" fold across one end of one piece. Fold it over again and iron it down. You can use straight pins if that makes it easier, and iron over those. Do the same thing with the other piece. 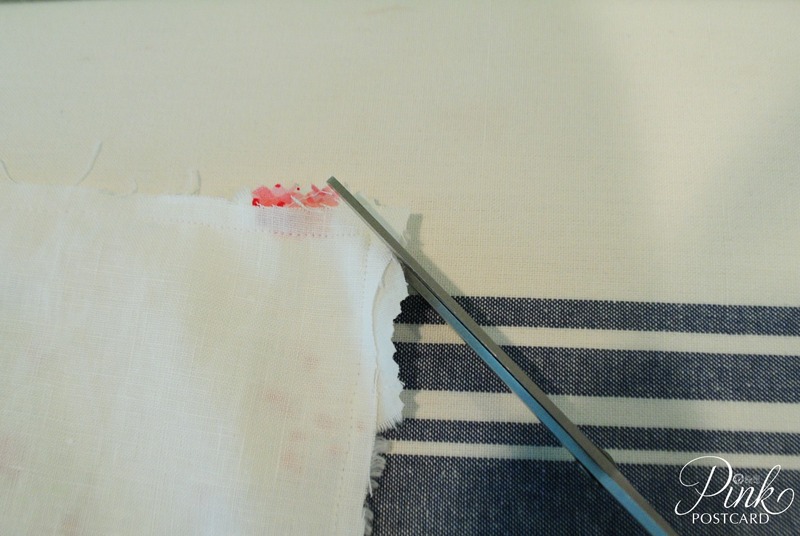 Now you are ready to sew the seams for the edges of your envelope enclosure, and the front of your pillow to the back. Your fold over seams for the envelope enclosure will be pretty narrow- for this I just use the presser foot on my machine to guide me right down the middle. Once you've done both pieces for the back, set those aside and grab the pillow top. 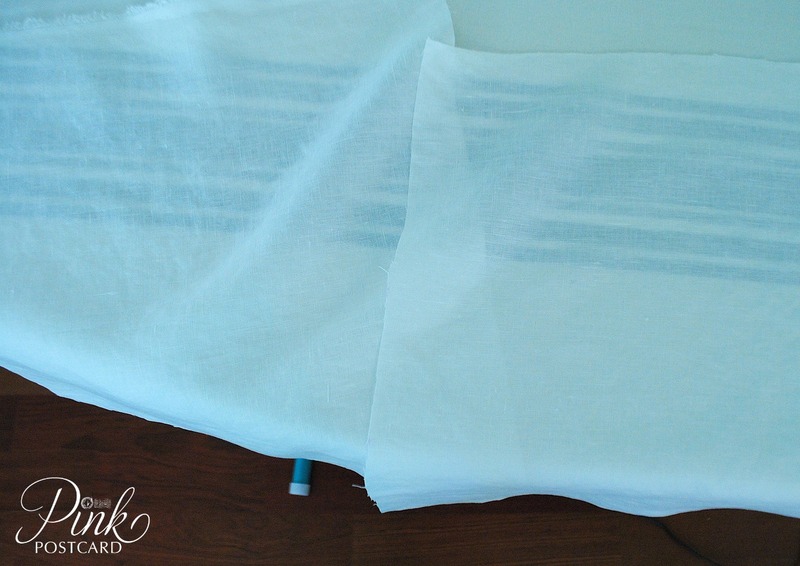 Lay your fabric with the side you want to see, facing up. Then lay both pieces of the back on top of the pillow front. You will need to make sure these have the side you will be 'seeing' face down on top of your pillow front. Basically, the pillow front and the pillow back need to be facing each other. It seems backwards, but you will be turning it right side out when we're done. Pin the top and the back pieces together. Your two back pieces will overlap, and that's exactly what you want. 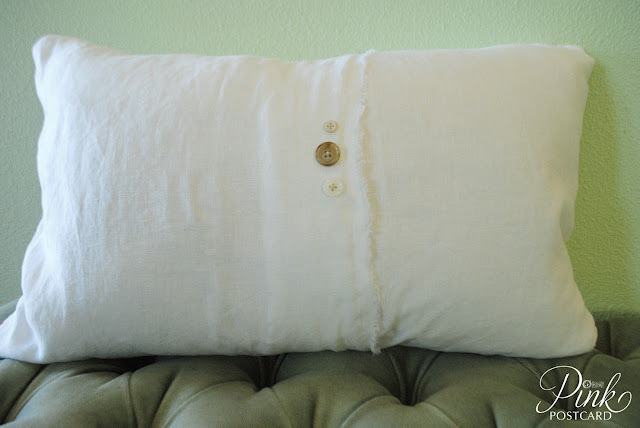 Sew a 3/8" seam all around the edge of the pillow cover. Remove your pins, and turn your pillow right side out. I always clip the corners of my pillow seams after the top and back are sewn together- it creates less bulk in the corners. Woo hoo! You did it! 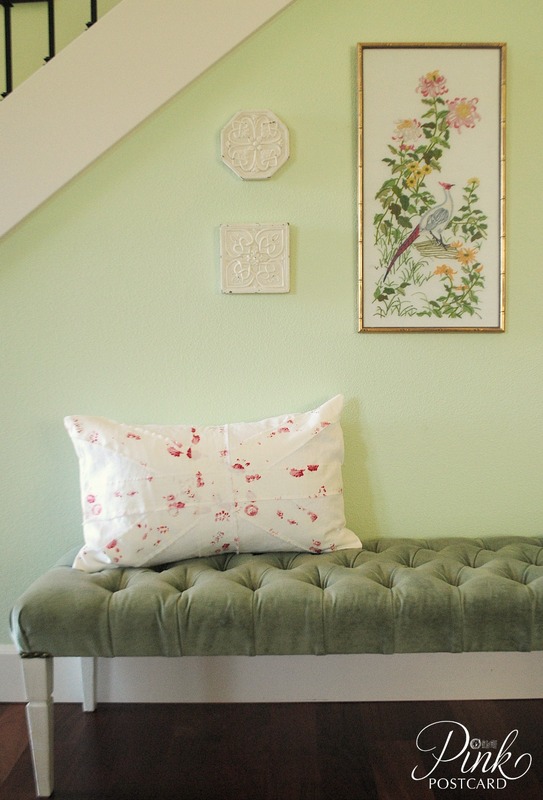 As you make more of these pillows, you can add some fun embellishments to either side. 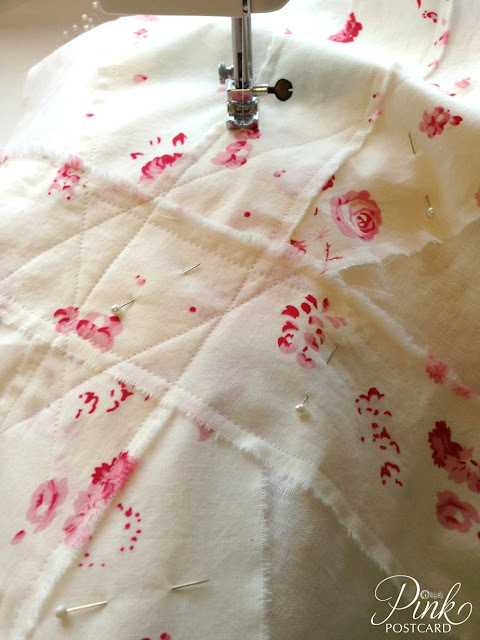 It's always easier if you do that before the front and back are sewn together as in step #6. I decided to add some vintage buttons to the back of my envelope enclosure, and also liked the frayed selvage edge instead of a fold over seam. 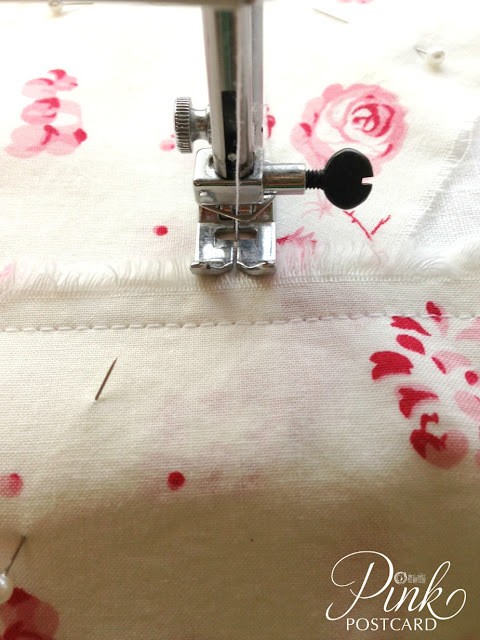 It may seem like a lot of steps, but if you can sew in a straight line, you can do it! So pretty... wishing I could sew!! The pillow is so very cute. Love it. Darn cute pillow Denise...saving this one for my pillow list for this month (I really need to pay a visit to my machine). Oh that is so cute, now I want to sew. Thank you for the 6" tip, mine always seem to pop open! 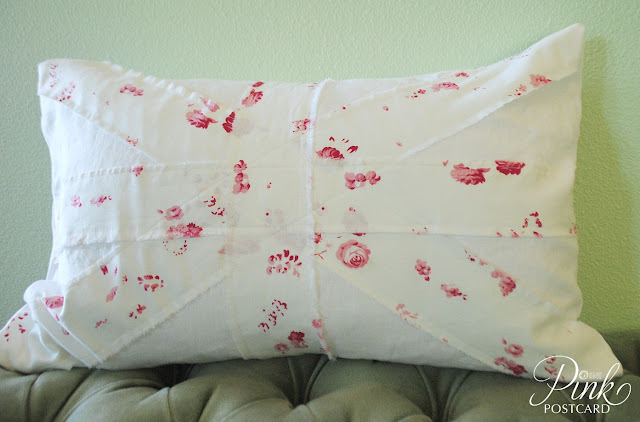 Beautiful pillow and great tutorial, thank you! Great tutorial! I love how you chose the floral fabric to make the Jack. It is subtle and pretty! 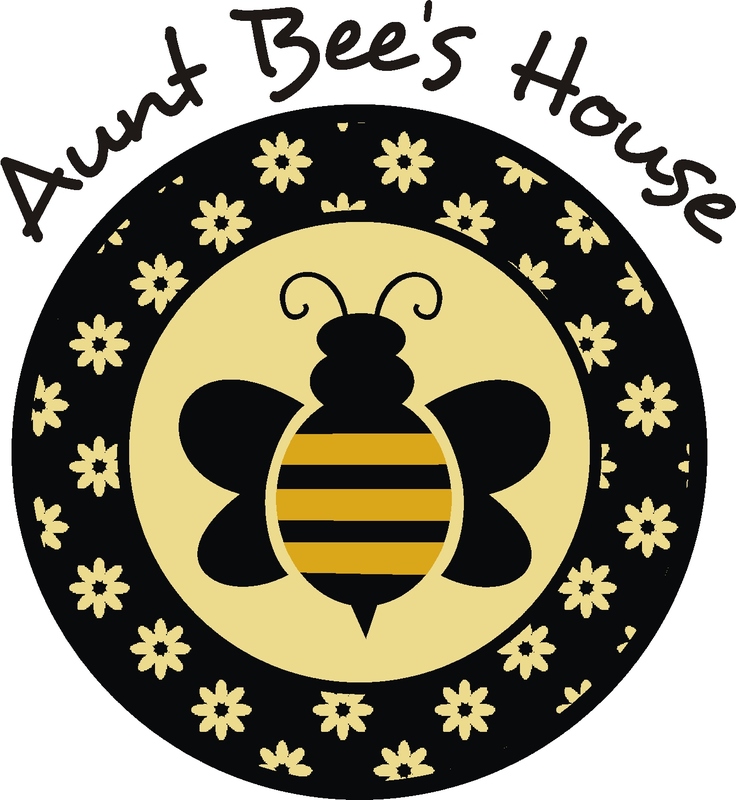 You always pick such interesting i visit your blog regularly for updates! Loved your description of it. Thank you for picking this one. The clarity in your post is just great and i can assume you're an expert on this subject.